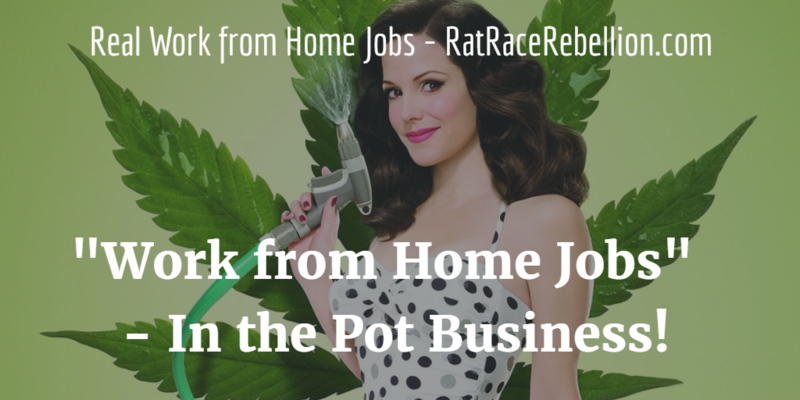 “Work from Home Jobs” – In the Pot Business! We’ve seen all kinds of work from home job openings over the years. But we were still surprised to find these — an Office Manager, an Editorial Intern, and even a work from home female CEO job — all in the pot industry. When most people hear “women and pot” they probably think of the Showtime series Weeds, where a suburban widow sells marijuana to support her family. Or maybe the notorious Scarsdale pot mom who made millions from a secret pot farm in a Queens warehouse (until she was busted by the DEA). But pot is legal now in Alaska, Colorado, Oregon, Washington and DC. And some would like to see more women join the industry as legalization spreads. Women Grow — which has posted the work from home jobs here — is one such group. For more, see Marijuana Moms Shatter the Grass Ceiling. This entry was posted in Work at Home Jobs and tagged Women Grow. Bookmark the permalink.